IDC and Appcelerator have published a survey of 5,778 mobile developers which highlights integrating with back-end data as the biggest challenge in app development. Appcelerator's product is a cross-platform mobile development tool, so note that the survey may not be representative of all mobile developers. Among this crowd though, 33.9 per cent spent more than half their development effort on back-end integration. This effort includes creating and debugging APIs, finding documentation for existing APIs, and orchestrating data from multiple sources. IDC also asked about target platforms: iOS and Android dominate, as you would expect. The most popular targets are iPhone and iPad, which grab the interest of between 80-90 per cent of developers, up a little from this time last year. Android phones have declined from 75 per cent to around 70 per cent. 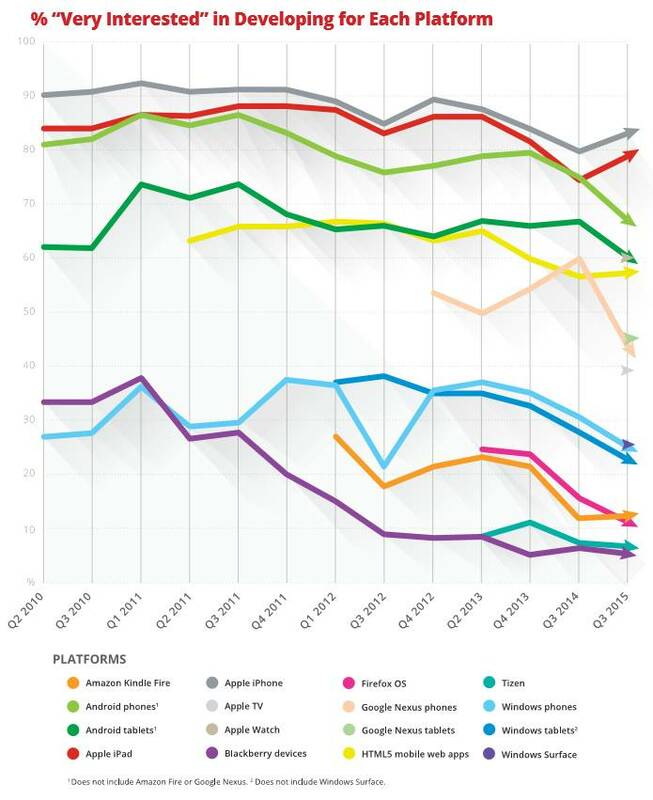 Windows Phone is down to about 23 per cent, from 28 per cent last year, with Windows tablets just below it. The disappointment for Microsoft is that all its hoopla about the Universal Windows Platform (UWP) does not seem to resonate here. That said, while Appcelerator's Titanium tool does support Windows Phone and Store apps, UWP developers may prefer Microsoft's tools. Apple Watch has made a good start, with 60 per cent of developer attention according to the survey (it is a tiny arrow on the above chart since it is new this year). What about making money? Only just over 60 per cent of those surveyed are primarily out to make money from apps themselves, with others aiming for goals such as customer loyalty and brand awareness.